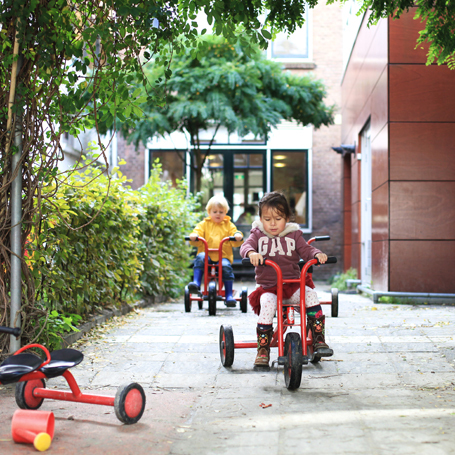 Dikkedeur started her child-care in Kralingen, in 1995. 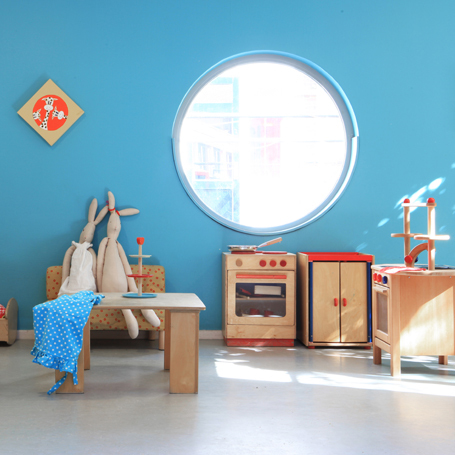 There are now two sites of day-care, at Oudedijk and Bethlehemstraat. Both are setup small and homely, in horizontal age-bounded groups, subdivided into babies and toddlers. You can recognise Dikkedeur by the furnishing: warm and appealing colours, special quality wooden furniture and kitchens, subtle design and light but cosy decoration of the groups. Additionally you immediately experience the tranquillity emitted by the groups. There is a large adjacent park-like outdoor play area: green, soothing and at the same time challenging for children. At Kralingen also many extras are available: gymnasia, extra outdoor areas, access to the nearby playground and strolling in the forest (Kralingse Bos) or taking the bolder wagon (bolderkar) to the play-farm.